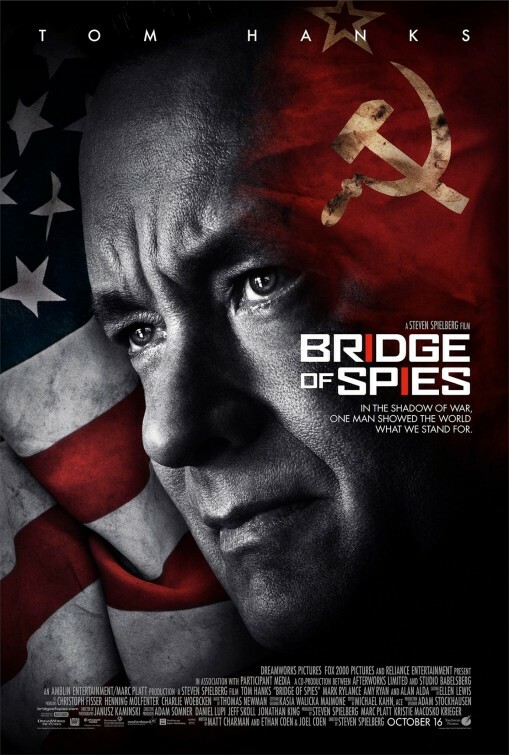 I’m ashamed to admit it, but in the months leading up to “Bridge of Spies”, I found myself not all that excited about the new movie directed by Steven Spielberg, starring Tom Hanks. Why am I ashamed to admit it? Because I’ve consistently enjoyed movies from both of them and most importantly, because this is a fine film. When it was still titled “Tom Hanks Cold War Film” I thought nothing of it, thinking we’d get yet another solid performance from Hanks and typically great direction from Spielberg. There’s no good reason for my thinking this way. Again, shame on me, since this intelligent and fascinating film is wholly engaging, grounded by a great performance from Hanks. “Bridge of Spies” is another historical piece from Spielberg that continues what he started with “Lincoln” – that is, using history to provide a certain perspective on American heroism. 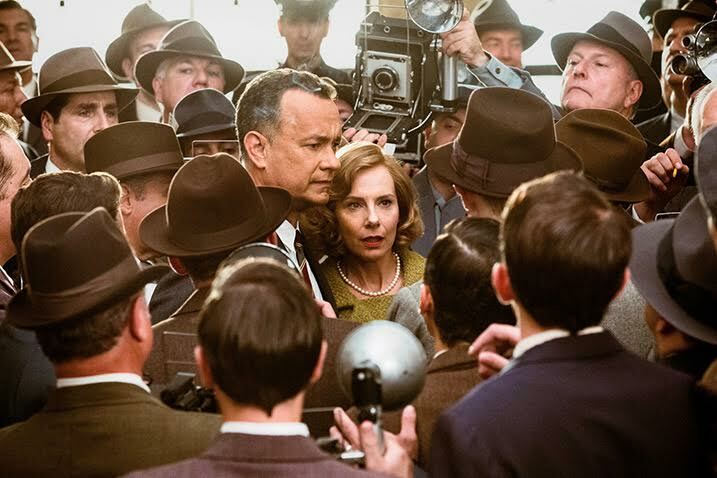 While politics exist in “Bridge of Spies”, it’s more along the lines of bureaucratic red tape and two-faced government officials entangling a dilemma that is seen as a black-and-white and ‘right and wrong’ series of situations from a seemingly ordinary character. It’s the late 1950s and Rudolf Abel (Mark Rylance) is arrested in New York City, because he’s Russian and apparently a spy. Or because, during the height of the Cold War, any Russian on U.S. soil would be deemed a KGB spy. He’s lined up for the death penalty to assuage the increasing national fear of nuclear war, but there’s also a need for a trial since the law still has to be followed. Insurance attorney James B. Donovan (Tom Hanks) is selected by his firm to represent Able in court. This doesn’t sit well with his peers, his friends and family or the judge presiding the court room. As much as it tarnishes his reputation, Donovan – a firm believer in the tenets of the American justice system – creates a rigorous defense for his client and manages to avoid the electric chair by securing a lengthy prison sentence. Not long after that, U.S. military pilot Frances Gary Powers (Austin Stowell) is imprisoned by the enemy, after his U-2 spy plane is shot down in Russian territory. This finds the U.S. Government scrambling to ensure that top-secret information isn’t leaked into enemy hands and that Powers is safely returned home. They tap Donovan’s services again, asking him to negotiate a trade – Abel for Powers – which finds the attorney in secret agent territory, traveling to East Germany (as the Berlin Wall is being finished) to negotiate with officials. Needless to say, events become increasingly complex from there. I thought this would wind up being Spielberg’s turn at a John Le Carré type spy story – think “The Russia House” or “Tinker Tailor Soldier Spy” – which are known for their dense (often confusing) storylines and interchangeable characters. It’s not. In fact, one of the selling points of “Bridge of Spies” surprisingly winds up being the economic and concise screenplay, which is easy to follow and often quite funny. Not overtly funny, mind you, but laughs are something you’re probably not expecting to find in a dour toned Cold War thriller – one that’s imbued with smoke, dust, fog and blue tones from longtime Spielberg cinematographer Janusz Kaminski – but then again, the screenplay is written by the Joel and Ethan Coen and British screenwriter Matt Charman. I can’t speak for Charman, but the Coen presence alone explains the wry humor and witty lines and the old-fashioned charm from Hanks and Spielberg, makes this a winning match for the screenwriters. The screenplay may have its monologues, but it never grandstands. Despite successfully balancing multiple characters one minor annoyance is how certain beats or a line of dialogue is repeated throughout the film. After teaming up for “Saving Private Ryan”, “Catch Me If You Can” and “The Terminal”, this fourth collaboration between the Hanks and Spielberg reminds us how they are an undeniable match and should not be taken for granted. So, my apologies to both. I don’t know what I was thinking. Sure, we may know what to expect from them, but when the outcome is always impressive acting with solid filmmaking, there’s nothing to whine about. Like his successful pairings with Harrison Ford and Tom Cruise – Spielberg has obviously found an undeniably satisfying partnership with Tom Hanks. What I was most surprised by was how fascinated I was by the story. It starts with the tentative friendship that’s built between Donovan and Abel, one founded on professionalism and eventually leads to mutual respect. Donovan may be ideal when it comes to following due process, but such idealism never feels antiquated coming from Hanks. Although we expect Hanks (who’s been referred to as a modern-day James Stewart or Cary Grant) to fit nicely in such a role, it’s obvious though how Donovan’s black-and-white point of view makes sense. Hanks has become the movie star we trust, who excels at being the humble, nose-to-the-grindstone good guy. Other characters may consider him a boy scout, but Hanks usually plays a character who ignores all that. That draws us in even more. We know Able’s not receiving a fair shake because we’re looking at what’s happening from our vantage point, but we also know what the public feared back then. 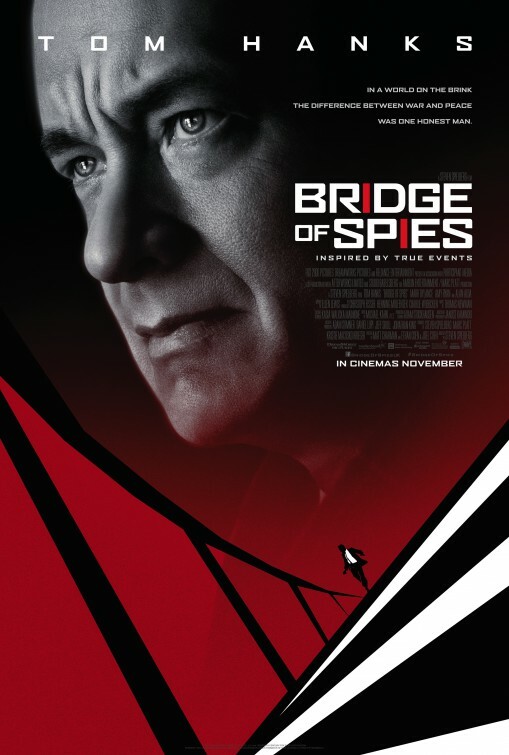 Rylance’s work here offers some sly nuances that actually make us wonder if he is or isn’t a spy – honestly, I’m still not so sure and I really liked that about “Bridge of Spies”. 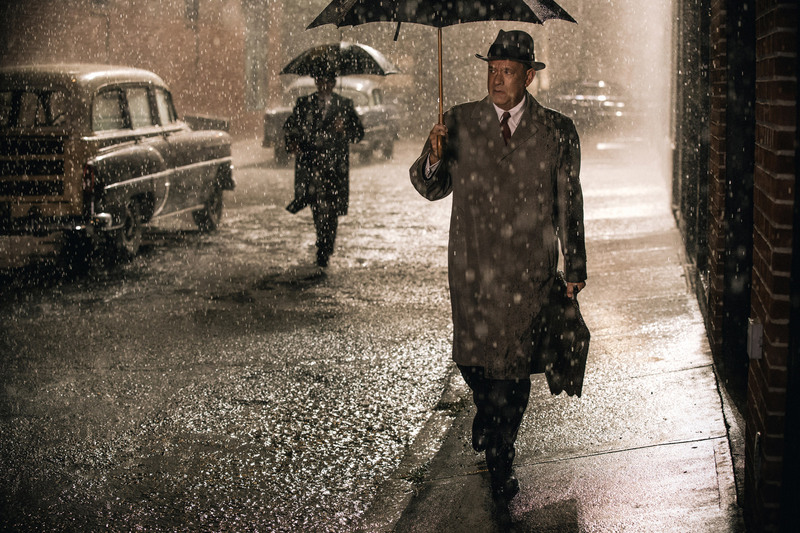 Another aspect of “Bridge of Spies” that I wasn’t planning on appreciating is the technical side of the film. Again, I don’t know why. Spielberg has always surrounds himself with fine artists (although Thomas Newman steps in for John Williams, who was likely busy with “The Force Awakens”), I figured it would look great with Kaminski lensing the film, but there are certain scenes and sequences that stand out, long after viewing. The introduction of Abel is a good example. He’s cast in stark lighting as he sits in what we assume is his apartment, looking into a mirror while painting his self-portrait. Without saying a word, the character comes across as a meticulous artist and his use of dark tones and prominent brush strokes offers an attractive contrast to the man we see and the man he sees. The introduction of American student in Berlin, Frederic Pryor (Will Rogers), riding a bicycle along the building wall is a quite memorable as well. At first, the character just feels like someone the camera follows in order to lend us context to a pivotal moment in history, not knowing that soon he would get caught up in Donovan’s mission (despite CIA protests). Then there’s the impressive U-2 spy plane crash sequence, where we spin and toss in mid-air with the pilot as he struggles to first maintain control of the aircraft and then quickly decides surviving is a better option. 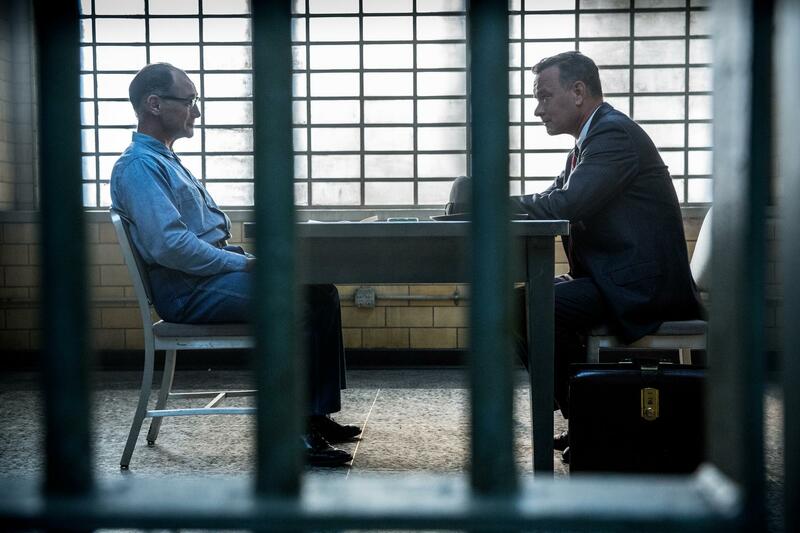 Those moments of stillness and movement linger, but “Bridge of Spies” also has some nice character touches as well. I especially enjoyed seeing the moments where Donovan’s domestic life is explored, before he takes off to Germany. There aren’t many scenes with his stalwart wife (Amy Ryan), but seeing his oldest daughter (Eve Hewson, yep, Bono’s daughter) dive to the floor as their home is riddled by bullets as the public communicates how they feel about Donovan taking the case, is intense – seeing how Donovan consoles and comforts his children though is endearing. These moments are short, long enough for us to get a greater understanding of who Donovan is and what situation he and his family are in. Spielberg delivers a solidly constructed picture, filled with mood and a wonderful appreciation for the era. Hanks brings a needed humor and intelligence to Donovan that makes the man an authority everywhere he goes, leading with humility, courage and a deep sense of justice.“Bridge of Spies” is full of intriguing conflicts and interesting personalities, executed superbly with dramatic fluidity by Spielberg, who offers an air of uncertainty to the true story that most viewers probably never even knew of.